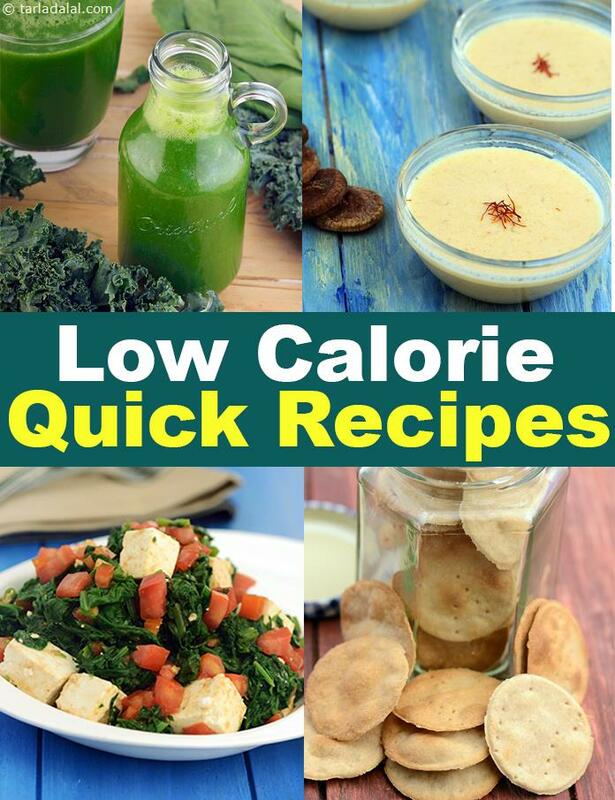 low calorie quick recipes. 'Quick cooking' is a buzz word which draws attention of every women, especially if you are working and don’t have much will power to wear your apron and get into the kitchen. Even homemakers will agree that recipes that can be whipped up in a jiffy always are on top of their cooking list. This section is all about cooking healthy for weight loss in minutes. Fruit and Lettuce Salad is a healthy salad that you can make when you don’t have enough time to cook. It is quite filling and will keep you satiated till snacks time. Even though it’s low in calories but it is high in other nutrients and antioxidants. Try your hands on this Matki Subzi a Gujarati recipe that is much loved by all. It is extremely easy to make and is loaded with protein, thiamine, iron and magnesium. Craving for pulao but do not know the art of cooking low calorie recipes? Here we bring you lip smacking low calorie Cabbage Pulao recipe made using brown rice. Being rich in fibre it is good for your tummy and also helps to lower your cholesterol levels. On a weight loss diet and feeling hungry but have no time to prepare snacks? Here we bring you quick snacks recipes to satisfy your hunger pangs and refrain you from eating junk. Green Peas Panki is an easy to make quick recipe that can be enjoyed by kids as well as adults for snacks, have it with a low cal healthy chutney. Karela Tikkis is made up of karela with carrot and low-fat paneer to make it surprisingly delicious. Karela contains 'gurmarin', a polypeptide that works like insulin in our body and helps to regulate blood sugar levels. Chana Dal and Cabbage Tikki is an amazingly tasty recipe with good protein and fibre elegantly flavoured with mint leaves. The combination of chana dal with curds gives it a nice peppy flavour when combined with Indian spices. While some of the recipes may demand pre-planning like soaking or pressure cooking, but once you have noted that down you can actually bring a healthy low cal meals at dinner table without much delay. Explore our other categories for low calorie recipes.